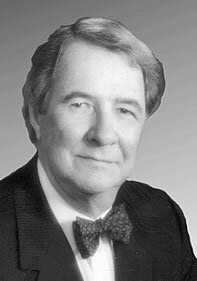 Dr. Grover E. Murray, a Charter Member of the Gulf Coast Section of SEPM, its first vice president and an Honorary Member, died on May 22, 2003, in Lubbock, Texas. He was 86 years old. Dr. Murray's long life was filled with outstanding achievements as a geologist, teacher, researcher, petroleum consultant, prolific writer, and a visionary administrator. He was an internationally renowned scientist. Grover Murray was born in Maiden, North Carolina. Soon afterwards, the family moved to Newton, N.C. where Grover went to public schools. Although his parents wanted him to go to Davidson College and become a Presbyterian minister, Grover chose to enroll at the University of North Carolina at Chapel Hill to earn a degree in geology. In his senior year, one of his professors recommended that he pursue his advanced degrees at Louisiana State University where the geology department was staffed with prominent professors such as Drs. Henry V. Howe, Richard J. Russell, and Harold N. Fisk. Grover received his M.S. in 1939 and Ph.D. in 1942 from LSU. He was employed by the Magnolia Petroleum Company in Jackson, Miss., as an explorationist until 1948. At that time he was approached by the departmental chairman of geology at LSU who asked that he return to the university as a professor of stratigraphic geology to replace Dr. H.N. Fisk who had resigned to set up Humble Oil's research center in Houston. It was common knowledge among the geology faculty that Grover excelled at unraveling complex stratigraphic sequences as demonstrated in his Ph.D. dissertation. On his return to LSU, he took the opportunity to have his dissertation published in 1948 by the Louisiana State Geological Survey as Bulletin No. 25 titled Geology of DeSoto and Red River Parishes. This was the first Louisiana State Survey bulletin which dealt with Cretaceous and Jurassic formations that produced prolific amounts of oil and gas in the northern part of the state. Grover also unraveled the complex stratigraphy of the overlying Tertiary sequences. It was here that he began to explore the complexities of basin-wide facies distributions. In addition to his teaching, he was also Director of Research for the State Geological Survey and was the Geology Department Chairman 1950-55. Recognizing his exceptional talents as a geological researcher and administrator, the university elevated him to the rank of Boyd Professor, the university's highest academic rank, in 1955. In that year Murray began work in earnest on his epic 692-page treatise titled Geology of the Atlantic and Gulf Coastal Province of North America. This writer enrolled in his Geology 106 Introduction to Gulf Coast Geology class in the spring of 1955. Dr. Murray would come into the lecture room with a reel-to-reel tape recorder, turn it on and proceed with his lecture. Afterwards, his secretary would transcribe the lecture. These lecture notes formed the framework of the book. The following year he took sabbatical leave to work on the book and continued to add to it until it was published in 1961. (Harper & Brothers published it in their Geoscience Series and sold it for a mere $24.00.) By this year, he had already published 55 papers on stratigraphy or stratigraphy-related studies. In his lifetime he published over 150 articles and books. His works are masterpieces, and because of this, it is no surprise that the GCAGS/GCSSEPM Transactions Best Published Paper Award is named in his honor. Although his seminal Gulf Coast text is now four decades old, it is still referenced in many modern-day publications-clear testimony to his diligence in his research for this volume. His contributions to the principles of lithostratigraphy, chronostratigraphy, and geochronology were many. It should be noted that his geologic interests extended beyond the U.S. Atlantic and Gulf Coastal plains. In the mid-1950s, Grover spent several years deciphering the lithostratigraphic units and the chronostratigraphy of Triassic/Jurassic red beds and late Cretaceous/early Tertiary strata in northeast Mexico. He also drew attention to the presence in the Precambrian of sufficient life forms and favorable sedimentary rock types to generate and entrap indigenous petroleum. His thesis proved to be correct when sizable reserves were discovered in sediments of this age in Australia. He worked as a geological consultant for over four decades, including work on all continents and participated in oil and gas discoveries in central Australia, Arkansas, Louisiana, and Mississippi. While he was president of Texas Tech, he served on the National Science Board and made numerous trips to Antarctica. In 1963, in further recognition of his administrative and leadership abilities, Dr. Murray was promoted to Vice President and Dean of Academic Affairs at LSU. Two years later he became Vice President for Academic Affairs for the entire LSU system. While serving in this position, in 1966, he was approached to accept the presidency of Texas Technological College in Lubbock, Texas. After eighteen years on the faculty at LSU, Grover accepted the position on September 1, 1966, and left for the high plains of Lubbock. At this time, Texas Tech was a small regional school, but Grover had bigger plans for this academic unit of the Texas university system. In his ten-year presidency, he transformed the school into Texas Tech University by significantly increasing the physical size of the campus, by increasing its enrollment and faculty, by establishing and building a Law School and Medical School, and by creating the International Center for Arid and Semi-Arid Land Studies. By the time he retired in 1976, he had transformed the university into one of true international stature. For a period of time, he served as president of the university and of the TTU School of Medicine. After his retirement, he continued to teach a geology course and returned to geologic consulting. During his long career as a geology professor, he served as the major professor and/or supervisor for over fifty students receiving masters and/or doctoral degrees. Many of these went on to have successful careers in the petroleum industry, academia, and government. Grover's philosophy concerning teaching was that if the teacher created the right "learning environment," the student taught him/herself. Above all, he insisted on excellence and was a strong advocate for "professionalism" in geologic endeavors. Although he maintained heavy obligations in his academic life, he thoroughly believed in the worthiness of fully participating in professional organizations. Grover was Editor of both the AAPG Bulletin and of SEPM's Journal of Paleontology, a distinction he shared with one other individual. He served as vice chair and secretary of the American Commission on Stratigraphic Nomenclature; trustee of the AIPG and director of the SEPM foundations; a fellow of the GSA; member of the IUGS International Subcommission on Stratigraphic Classification; member of several commissions and committees of the National Association of State Universities and Land-Grant colleges and the national Science Board; and chair of U.S. National Committee on Geology. He served as president of AAPG, SEPM, AGI and of the AIPG. Being the activist and visionary individual he was, recognition and highest honors naturally flowed his way. Grover received AAPG's Sidney Powers Memorial Award, SEPM's Twenhofel Medal, the Ian Campbell Medal of the American Geological Institute, and the Ben H. Parker Medal of the American Institute of Professional Geologists. He also received the Hollis D. Hedberg Award in Energy, the Antarctica Service Medal, and Distinguished Alumni Awards from the University of North Carolina and Louisiana State University. He was designated as a Texas Distinguished Scientist in 1986. Grover held memberships in several honor societies including the Golden Key, Sigma Xi, Sigma Gamma Epsilon, Omicron Delta Kappa, and Phi Kappa Phi. It is fitting to close this memorial with a quote from Grover's citation for his SEPM Twenhofel Medal Award written by James M. Coleman, "This summary of Grover's activities and honors does not begin to describe the man or to hint of the esteem in which he is held." Indeed, his life was one of intense dedication to the science of geology, a fervent desire to improve the institutions he served, and to instill in all his pursuit of excellence in every endeavor. He left a legacy which will endure forever. We extend our condolences to Sally Sowell Williams Murray, whom Grover married in 1986, to his daughters Martha Murray Poag and Barbara Elizabeth Murray Baca, grandchildren Tracy Poag, Marla Poag, and Graham Poag, great-grandchildren Nathan Poag and Caleb Poag. Grover's first wife and mother of their daughters, Nancy Beatrice Setzer, died in 1985. We also extend sympathies to C. Wylie Poag, Jr., who was president of the GCSSEPM in 1972-73.